The Prime Minister of Papua New Guinea, Peter O'Neill has announced that he will meet with United States President, H.E. Barak Obama, and the leaders of four small island nations facing the threat of destruction by climate change. The meeting comes following the intervention made by Prime Minister O'Neill, at the APEC Leaders' Meeting in Manila last week, and subsequent discussion with President Obama at the conclusion of the meeting over his concerns at the threat faced by small island nations. "At APEC I highlighted the fact that there are Pacific island nations that are at risk of being destroyed as a consequence of climate change," PM O'Neill said. "These nations will no longer existing as countries in the space of our own lifetimes if action is not taken on climate change now. "If no action is taken, these proud nations with their rich culture and traditions, will become uninhabitable and abandoned. "President Obama shares our concern for the survival of threatened communities and we will meet again following the opening of the United Nations Climate Change Conference in Paris next week. "The meeting will be attended by the Leaders from Kiribati and the Marshall Islands from the Pacific, as well as leaders from other threatened island nations, the Seychelles in the Indian Ocean and St. Lucia and Barbados in the Caribbean." PM O'Neill said he appreciates the support of President Obama in dealing with the challenges faced by Pacific Island Nations and other countries in a similar situation around the world. "Rising sea levels and extreme weather brought about by climate change was not caused by small island nations, but they are being destroyed because of it. "As Chair of the Pacific Islands Forum, I would like to express my appreciation for the concern shown by President Obama for our Pacific island nations, and for people in countries around the world facing the same threat. "When we meet at the UN climate change conference next week, likeminded countries will be seeking a binding agreement for action to deal with climate change. "We will also be seeking a commitment from larger nations to help the smaller countries most at risk from climate change to protect their communities and their ways of life." The United Nations Convention Climate Change, the twenty-first session of the Conference of the Parties (COP-21), will open in Paris on 30 November. 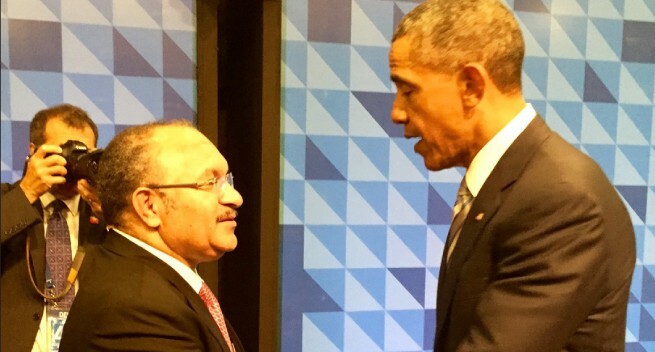 Prime Minister O'Neill's meeting with President Obama and island leaders is scheduled to take place on 1 December.